Dear Santa, I don’t like the cadre and secret cabal I got last year. Next year I’d like some openness, competition and democracy instead. Recently the PAP held their first Party convention post election allowing us to scrutinise the cadre system and the iron grip on power that it provides for. AlexAuwrote about it in his blog (http://yawningbread.wordpress.com/2011/12/03/four-barriers-to-remaking-the-pap/) where he highlighted his opinion that the cadre system is one of four main reasons why the PAP would fail to learn any lessons from their setback in GE 2011. The rest of his reasons would be worthy of discussion in a separate article in their own right. However as we look back at 2011 I will concern myself with a closer look at the cadre system and how it affects your ricebowl. It is of course not only the PAP who employs the cadre system. For the benefit of those who may be unfamiliar with the term, a cadre system is one in which the leadership of the Party selects certain members to be cadres. The cadres are then the only members who have voting rights and they elect the leadership. It is of course a completely closed system in which the leadership ensures its position by only selecting as cadres people who will be loyal to them. The cadre vote the leaders who select the cadre who vote the leaders who select ………………..and so on. In her 1971 political science thesis, “Singapore’s People’s Action Party: Its History, Organisation and Leadership (Oxford University Press)”, Ms Pang Cheng Lian, who sits on the board of Temasek Cares, describes elections to the CEC by the cadres as a “closed system”, in which “the cardinals appoint the pope and the pope appoints the cardinals”. Most of us Singaporeans know this system is employed by the men in white. Sadly, as far as I am aware, every other political party in Singapore employs a variant of the cadre system. This includes the Workers Party, the SDP, the NSP and the SPP. I have no information about the other new parties, the Justice Party the USD (does anyone remember them? ) and the new parties still to come in 2012 but I believe it is safe to assume they all employ or will employ the same system. Just as Alex believes the cadre system may explain why the PAP is incapable of learning new lessons so I believe that adherence to the cadre system may be partly responsible for the agonisingly slow progress of the Opposition parties and the dearth of new ideas or renewal. It is certainly the culprit behind the endemic Party hopping which discredits all Opposition equally and has nothing to do with renewal of ideas. Party hopping is the same old faces, with the same old ideas but with new titles. It would take a visionary to develop a party with a radically different structure. Or maybe a democracy veteran with no time left to lose who, looking back on his life’s work, realised that closed organisations can’t give birth to Open Societies. Yes, The Reform Party is the only political party in Singapore which is a democracy since it alone does not have a cadre system to protect the leadership and all members have voting rights. The cadre system has its origins in the Marxist concept of the “dictatorship of the proletariat” and the “vanguard”. This meant that only a small elite group of individuals were fit to lead the Communist Party and the nation. The masses were not ready for democracy and it was better that they be led by those who knew best. The Communist ideal was one of eventual full democracy once the masses had been educated enough. Leninargued (Wikipedia, http://en.wikipedia.org/wiki/Vanguardism) the ideal vanguard party would be one where membership was completely open and its workings transparent, the “entire political arena is as open to the public view as is a theatre stage to the audience” (from What is to be Done?). He seems to be acknowledging the benefits of competition though cannot speak its name when he goes on to say that a party that supposedly implemented democracy to such an extent that “the general control (in the literal sense of the term) exercised over every act of a party man in the political field brings into existence an automatically operating mechanism which produces what in biology is called the “survival of the fittest”.” This party would be completely open to the public eye as it conducted its business which would mainly consist of educating the proletariat to remove the false consciousness that had been instilled in them. The cadre system went on to be adopted by both the Kuomintang and the Chinese Communist Party and by many other Maoist revolutionary parties throughout the world. Lenin originally intended it to deal with the problems of controlling and maintaining the secrecy of the Bolshevik party which was seeking to overthrow the Czarist regime in Russia, in the face of infiltration by the Okhrana, the Czar’s secret police. Ironically the goal of preventing infiltration, this time by Communist agents, is the oft-cited justification given by the PAP leadership as to why the cadre system was introduced. If so it does not justify its retention today when there is no longer a Communist threat. Even if there were the ideal way of combating it would surely be through more democracy not less. Of course the Communist roots of the PAP are not a secret. This is why the arbitrary arrest and detention of certain individuals on the grounds that they were Marxists and that they represented a secretive organisation is particularly ironic. The fact that the PAP continue to maintain a cadre system shows how out-of-step they are with modern democratic parties and how little understanding they have of the benefits of competition and transparency and accountability. While they maintain a closed system which ensures that only people, who hold the leadership’s views, whether out of principle or self-interest, get to vote, it is difficult to see how any renewal can take place. Perhaps it is too much to expect the ordinary people of Singapore to understand the need for multi-million dollar salaries for ministers. They are afflicted with the false consciousness of a belief in democratic values and the equality of individuals. You need elite (the cadres) who are sufficiently intelligent not to fall prey to false consciousness to understand why servant leaders need millions of dollars as remuneration. Hopefully the review board will be able to explain it to us shortly. However the other parties inSingaporeclearly feel the same way as the PAP that democracy is a dangerous idea and power should not be entrusted to the ordinary members. Or they merely aspire to be the PAP and adhere slavishly to their ideas and methods-PAP LITE, if you will. Whatever the motivation, all of them maintain some sort of cadre system. The argument often given for the necessity of this is that it leads to “stability”. This is just another facet of the argument that democracy leads to gridlock and that the people are too short-sighted or stupid to exercise power responsibly. Even if a so-called extreme faction managed to be elected to the leadership, like the AWARE situation, ultimately democracy ensures competition. If the new leadership fails to reflect the will of its members or is unsuccessful at winning electoral office then it can be replaced. It is genuinely worrying that so much of the Opposition shares the same mindset as the PAP. This begs the question as to whether their leadership are genuinely interested in change or representation or whether it is merely power that they seek. To recap on what I said earlier, the only party that does not have a cadre system is the Reform Party. The RP is thus the only genuinely democratic party. Instead of a closed system, the RP CEC is elected by the Party Conference which is made up of delegates. Everyone, provided they fulfil basic criterion, gets a vote. As a result the Party is the purest expression of the will of its members. The Party Conference promotes a free market in ideas as any member can put forward a motion. As it forces anyone running for office to be responsive to the views of the members, it represents the implementation at the Party level of the principles we are fighting for at the national level. We refer to this as Conference being Sovereign. It is clear that when JBJ set up the RP he wanted to have nothing to do with secretive cabals and backroom deals and start a party that would exemplify the virtues of democracy. 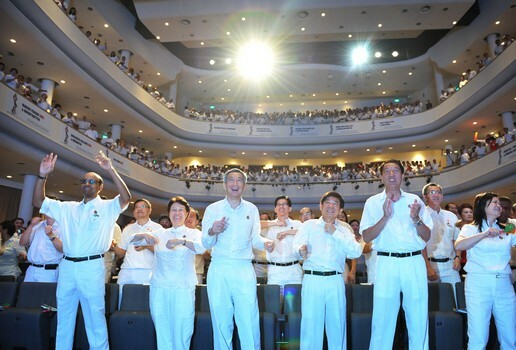 He learnt from bitter experience, when he was ousted as SG of the WP, how dangerous an unrepresentative clique is. In a way a genuinely democratic party was his legacy to the nation and serves as a model of what we need to see at the national level. Many are scared away from joining the RP because of the lack of a cadre system which they feel makes it inherently unstable. Certainly its first three years have not been an easy ride. But if democracy itself is something we seek and value then a truly democratic Party is a necessity. As the RP is not a good long term bet for ironclad power, it is less attractive as an option to those who are power hungry or egotists. Why go to all that trouble to infiltrate a party to make it less radical, less viable as an agent of change, when you may be voted out in 2 years time and the Party may simply revert to its former state? This is what we saw happen with Aware. A group of women cleverly saw that getting like minded members in the organisation in sufficient numbers was key to changing its identity. But ultimately Aware was strong enough and its original ideology and had been in existence long enough to shake off that challenge. No doubt many initially joined RP in error not clearly realising the ramifications of the democratic nature of the constitution. What a shock it must have been to them to realise that Conference is Sovereign and yes, they would actually need to get a majority vote from ordinary members to change the constitution and bring in a cadre system. How much easier it was to simply do a deal for power and leadership elsewhere in exchange for sabotage. And how much more effective to do it in collaboration with the State media, ever hungry as they are for dirt. But here is the surprising thing. RP as an organisation , as Aware did before them, similarly survived with its democratic nature intact and went on to field 11 candidates in GE 2011. So maybe democracy is not the greatest weakness of a political party but its greatest strength in the long term. Certainly many commentators like Alex are now seeing the cadre system as responsible for hampering progress within the PAP and its greatest obstacle going forward. What next in 2012? Well the PAP cadres have concluded their convention and business goes on as usual within their closed circles. There has been a lot of talk of Opposition parties joining forces in a grand coalition as well as of new parties being set up. However the important question for voters should be whether any of the parties are genuinely democratic. I would not wish the RP to merge with another party for example, unless that party were also to adopt a democratic constitution and abandon the cadre system. My fervent wish for 2012 is that any new party set up will be Democratic and that through openness and with competition fostering progress we will go forwards as a Nation and not backwards. We need to change the old Singapore/PAP influenced Model so that we can have a better future. As always I am daring to imagine a new rice bowl for an advanced Asian nation. Thanks, Ken, for another insightful post. I share your wish for 2012.